This month's Donwakai will be held at the St.Regis Bar & Grill located in downtown Vancouver at the corner of Granville and Dunsmuir. They will have a number of drink specials for us as well as a wide array of food choices. For smooth ordering we recommend you pay by cash. An ATM is available on site. In addition to the usual good company, conversations and networking this month will see the unveiling of Mokuyokai's New & Improved Website!! Please join us for a fun evening with those who share an interest in Canada-Japan relations. 場所変更: セント レジス　608 DUNSMUIR ST.
We're hiking to one of BC's most beautiful lakes – Garibaldi! This is one of the best hikes in the area. Please note that it is a long hike and only experienced hikers should come. The first 6km of the trial is a gradual uphill climb through dense forest of Douglas Fir trees. We'll then pass The Barrier (a 2km thick lava dam holding back Garibaldi Lake) and two smaller lakes before reaching majestic Garibaldi Lake. We'll relax, eat and enjoy the beautiful scenery at Garibaldi Lake before returning the way we came. When: Sun, July 27th (9am~6:30 pm) (including transportation and hiking). We will not go if the forecast calls for rain. 1) Vancouver Visitor Centre at 9am (sharp) (Corner of West Cordova Street and Burrard Street). What to bring: *Proper* footwear (hiking boots/running shoes), a big lunch, snacks, sunscreen, camera, water (minimum 1.5L), water-repellant jacket, sweater, some cash. Extra shoes are a good idea so that you do not muddy your driver's car. Please note that the weather can change quickly and given the elevation gain, the temperature is significantly cooler near the Lake. We will not stop on the way, so participants *must* come prepared. Mokuyokai reserves the right to turn away unprepared participants. Car Pooling Fee: Please give your driver ~$10 for gas as Garibaldi Lakes is a bit of drive from Vancouver. Mokuyokai arranges car-pooling on a first come, first serve basis. For example, if someone RSVPs and can drive 3 people, the first three people who signed up get a lift. Drivers are usually in short supply, so if you can drive, it is appreciated. 3) Can you meet at the Vancouver Visitor Centre or at Park Royal Shopping Centre? At the Donwakai, you will meet approximately 100 people who have a strong connection to Japan: teachers, travellers, students, business people and others from Canada, Japan and elsewhere. You don't have to speak Japanese to attend this event, but you should have a strong interest in or connection to Japan. Most of our participants have lived or travelled in Japan at some point in their lives. We also have Japanese-only table and one English-only table if you want to practice your language skills (the rest of the tables are whatever the participants are speaking). The atmosphere is casual and feel free to invite a friend. The Donwakai is on the left side when you enter the Yaletown Brewing Co – come in through the main entrance on Mainland Street. In order to keep the Donwakai going strong, participants are required to order something off the menu (minimum of $5 before taxes and gratuities) but we'll still provide some appetizers. Good news for beer lovers - Yaletown Brewing has lowered prices on all fresh beer by ONE DOLLAR for the Summer season. In addition, they offer a "Brewer's Selection" Monday-Thursday which is a beer for $6.00 (tax-in) selected by the Brewmaster to be on special. As well, on Thursdays they also offer an exclusive Cask beer for guests which is a variety not on our menu, is traditionally brewed, and once it's out, it's out. citizen, please bring your passport or BCID. June 14th World Cup Dinnerkai at Kamei Baru! Join Mokuyokai as we cheer on Japan in their first game of the 2014 Soccer World Cup against Cote d'Ivoire. Wear the samurai blue colors, watch the match on the big screen while enjoying great food and drinks at Kamei Baru. The restaurant will have their own promotions and specials we can enjoy. The number of spots is limited so please RSVP early. Maximum # of participants: 20. Feel free to invite a friend! Donwakai will be in a NEW venue tomorrow. Due to circumstances beyond our control tomorrow's Donwakai will be held at the St. Regis Bar & Grill located in downtown Vancouver at the corner of Granville and Dunsmuir. Join us for the first Mokuyokai bilingual yoga experience with a proud Mokuyokai "yogi" member, Mari Mizobe Chu! Whether you are a complete newbie, or an experienced practitioner, you'll find fun in this special yoga class! Join us NEXT WEEK for Donwakai! At the Donwakai, you will meet approximately 80 people who have a strong connection to Japan: teachers, travellers, students, business people and others from Canada, Japan and elsewhere. You don't have to speak Japanese to attend this event, but you should have a strong interest in or connection to Japan. Most of our participants have lived or travelled in Japan at some point in their lives. We also have Japanese-only table and one English-only table if you want to practice your language skills (the rest of the tables are whatever the participants are speaking). The atmosphere is casual and feel free to invite a friend. The Donwakai is on the 2nd floor – come in through the main entrance on Smithe Street and watch for the notices. In order to keep the Donwakai going strong, participants are required to order something off the menu (minimum of $5 before taxes and gratuities) but we'll still provide some appetizers. 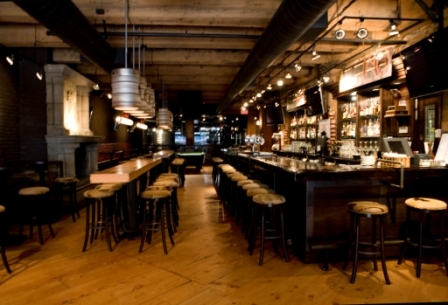 On Thursdays, Ceilis has a great $4 special for pints on Thursdays and hearty pub food. Don't forget your ID and please remember to tip your server. Our Stawamus Chief hike on May 3rd has been **cancelled** due to rain. We will reschedule to a different weekend in the next couple of months. Our next hike will be the Ghost Town Hike - stay tuned for details!! Hike to the Parkhurst Ghost Town (near Whistler) on Sun, May 11th. Rating B2. On Sunday, May 11th, we're going to a Ghost Town near Whistler! The Parkhurst Ghost Town is the remains of an old, small logging camp that started in the 1920s and continued to the 1960s. Today there is but one shack standing; the rest have fallen down but there are some old cars and other reminants. For those who don't know, it is called a Ghost Town because it is abandoned - it is not haunted. It is a fairly easy hike to Parkhurst from a parking lot off the main highway: it is about 5km round trip and an hour each way. There are some small elevation gains and the trail is through a forest. You need good shoes, as there will likely be some muddy parts. It is also very important that participants stick together, as the trail is poorly marked at times. We may go for a meal afterwards near Whistler. You must rsvp to attend this hike. Cost: Members: Free, Non-Members: $5. All must pay their driver $7-$10 for gas and their time. RSVP to Michael Marland (hike@mokuyokai.bc.ca) by Friday, May 9th (spots in cars are awarded on a first come, first serve basis). What to bring: Hiking shoes, jacket, lunch, water, camera, cash, sweater. We are not stopping for anything along the way, so come prepared! Mokuyokai reserves the right to turn away unprepared participants. We will arrange car-pooling from the Vancouver Tourism Info Centre. It works on a first come, first serve basis (i.e., if someone RSVPs and can drive 3 people, the first three people who signed up get a lift.) Drivers are usually in short supply, so if you can drive, it is appreciated. There is a bit of mud leading to the parking lot. Please try to give Mokuyokai as much time as possible if you need to cancel. Cancellations 24hrs our less before the event cause issues with car pooling. (It is Mother's Day, so please double check to make sure you are free that day.) If the forecast calls for heavy rain, we will cancel. That decision will be made the night before. This rating system indicates the difficulty of the activity and how long it will take. Please note that this is just a reference and the time may differ depending on the condition and participant's abilities. Ever wonder what the view is like from that huge face of rock at Squamish (on the way to Whistler)? Hike with us up this famous trail and be rewarded with a stunning view of Howe Sound. Difficulty level is moderate-hard; hiking time is 6 hours. COST: MEMBERS FREE; NON-MEMBERS $5 Pay your driver for gas as well! RSVP: email to hike@mokuyokai.bc.ca by Thursday May 1st.